A wheel is composed of the inner spokes, the rim that connects the spokes and the outside tire. Wheels are connected by an axle so they can work in pairs to allow your vehicle to move. The tread on the tires protects the inner portion of the rim and helps the wheel grip the road to increase safety and efficiency. Without wheels, your car would not be able to function. This is why keeping on top of tire rotation service and other maintenance is so important. To learn more about wheels and how they work, contact Meineke #730 in Gastonia, NC. Tires are arguably one of the most important parts of any vehicle. This is because they are what helps your car or truck cling to the road and have enough traction to safely operate. Your car only accelerates, turns and stops because your tires allow it to. Tires also play an important role in gas mileage. When they are improperly inflated they lose fuel efficiency and you end up paying more at the pump. At Meineke #730 in Gastonia, NC, we service cars while and act as a tire repair shop. Contact us for tire change service for all your vehicles. If you have older or damaged tires, you may be wondering about potential warning signs. Fortunately for drivers, many of these signs are easily observable to the naked eye. If you notice that your tires are punctured or cracked, it may be time to consider taking your vehicle to a tire change service provider. If your pressure sensor constantly gives low readings, even after you fill your tires with air or change them, your car may need to undergo tire pressure sensor replacement. Many of these issues are signs of severe damage, so call our Gastonia, NC, Meineke #730 location if you notice any of them. Tires are vital to the function and safety of your car or truck. The ridges and patterns that make up the tread of your tire are what help it grip the road and shed water to increase traction. When a tire's tread wears down, your vehicle no longer has the same traction and can become more unpredictable or more difficult to handle safely. Underinflated or overinflated tires often cause sidewall damage that can be dangerous, which can lead to sudden tire explosions on the road. Your tires should always be kept properly inflated. Learn about tire pressure sensor replacement when you stop by Meineke #730 in Gastonia, NC. If the tire pressure sensor light illuminates on your vehicle's dashboard, should that be an automatic sign that your tires need to be replaced? Not necessarily. Depending upon the current condition of your tires, a simple repair may be all that needs to extend their life and save you money. How are you to know? Finding out for yourself literally only takes a penny. Insert a penny into the tread of your tires, with President Lincoln's head facing downward. If any part of his head is hidden by the tread, your tires can still be used. If the dashboard light continues to go off, you may want to consider a tire pressure sensor replacement. 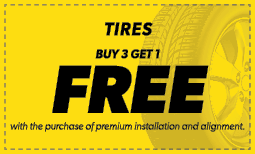 Any tire-related questions you may have can be answered by our friendly staff at Meineke #730 in Gastonia, NC. Because tires are your vehicle's only direct contact with the road, they should always be kept in the best possible condition. Tire rotation cost is a small price to pay to ensure that your vehicle is safe. Moreover, you can actually increase your fuel mileage by keeping your tires well repaired and maintained. Save money in the long run by taking your car or truck to Meineke #730 in Gastonia, NC for inspection, maintenance and repairs. We offer competitive pricing and tire rotation coupons to help you experience the best savings possible without compromising safety.